We offer a full range of air conditioning services, including installations, upgrades, preventive maintenance, repairs and a service contract. If you currently have no central air conditioning, we can make your home more comfortable and attractive with a new central air system. We specialize in installing high-efficiency systems, which can reduce energy consumption by up to 30%. Air conditioning has come a long way in recent years, and today's best systems cool more effectively than older systems while also taking up less space and generating less noise. Today's units also contain environmentally friendly R410A refrigerant. We represent some of the best names in the business, and we can help you choose a system that suits your home and your budget. We sell, install and service all major brands of residential and commercial central air conditioners, including the newest ductless mini-split systems, which allow you to cool your home without ductwork. Ask us about upgrading to a new super-efficient air conditioner - you could save hundreds of dollars on your energy bills! Click here to read more about our cooling installations and the leading brands we sell and service. We provide expert cooling service that helps us detect problems early ... before they become big, expensive headaches! We also offer a comprehensive cooling service plan that includes your tune-up, priority service and discounted parts and labor. 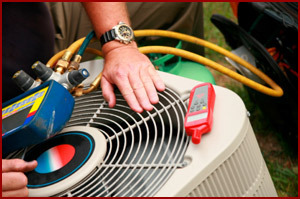 To read more about our air conditioning service plan, click here. Anything else you'd like to know about our air conditioning services? Contact us now.